EMG watches have proven extremely popular, after our first Week on the Wrist feature with their DL63 Panda Chronograph. The EMG Horizon is the latest from the fledgeling brand. EMG kindly loaned us a prototype watch so we could share our thoughts with our readers. 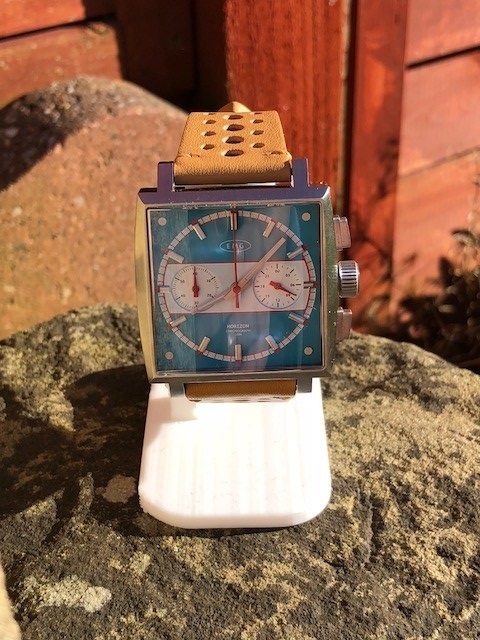 The EMG Horizon is a square-case chronograph watch with a racing theme. It will be made in a range of colours, and launches later this year – probably on Kickstarter. This is a prototype and so not fully representative of the finished product – we’ll cover the changes in the final product later. The watch is powered by the popular VK64 Meca-Quartz movement – essentially this is a quartz watch with a chronograph that has a smoothly moving second hand and mechanical style “instant reset”. It’s a movement we see in a lot of microbrands, and it combines the accuracy of quartz with the satisfying feel of a mechanical stopwatch. First impressions of the watch were good. This is a bold-looking timepiece and the turquoise colour makes it stand out immediately. The weight feels about right, and there are no sharp edges or areas of poor finish on the case. It feels a tad thick, and this is likely due to the influence of the Heuer Monaco on the design. Indeed the watch feels comparable in size, shape and “wrist feel” to that classic racing chrono – at a fraction of the price. We really liked the design of the case, it really makes it stand out from the crowd of “black dive watches”. The crown is engraved with a cog design (or maybe it is a flower). We’d have preferred something like a steering wheel, or the brand logo, but it is perfectly acceptable to use. The chrono pushers are quite small, and we struggled to push them with our fat fingers. A longer button or more prominent design would have made this easier. The back of the case is laser etched with a steering wheel design. The biggest issue we had with the design was the crystal. It is horizontally curved, and so when looking at the watch on an outstretched wrist it distorts the dial in such a way as to make it impossible to read the time. It is remedied by ensuring that the watch is viewed in the proper “12 O’Clock up” position, but is noticeable in everyday use. The dial is nicely layered, and features a turqoiuse base with a white strip along the middle. Within that strip is a dial for elapsed minutes (for the stopwatch function) and a 24-Hour dial. We missed having a date function – although to fit one in it owuld have meant losing some dial text or a subdial so we understand why that stylistic choice was taken. Still, it makes it annoying as an everyday wear. The logo and dial text is printed – we prefer applied brand logos but this one looks okay. We did find all the text was very small and difficult to read. Of course, none of us really read it regularly, but it might have looked better a little bigger or bolder. The indices are applied and are luminescent. The lume is not very bright or long-lasting but perfectly serviceable in the target price range. The hands are white, and easy to read except when they cross the white strip on the dial – something which EMG are addressing in the final product. The strap is a thick, 22mm leather “rally” type with a nice grain and oversized holes. We thought it felt soft, supple and comfortable, but it will be upgraded in the production watches. The buckle is a plain steel type. A customised signed buckle or deployant would be a nice touch, but not essential. Strap changing will be a little awkward due to the design of the lugs, but to protect it from scratches drilled through lugs will be provided on the finished product. Every colour option looks brilliant, but the turquoise is just something else! We think that with these changes the watch will be even better – and it is great to see a brand responding to feedback like this. EMG are definitely a brand to watch for the future. The EMG Horizon is coming soon. To keep updated, watch for updates on the WRUK Facebook page and sign up to EMG’s mailing list.